A Battle Royal is a Pokémon Rumble-esque type of battle in Pokémon Sun & Moon. It involves four Trainers battling each other at the same time. 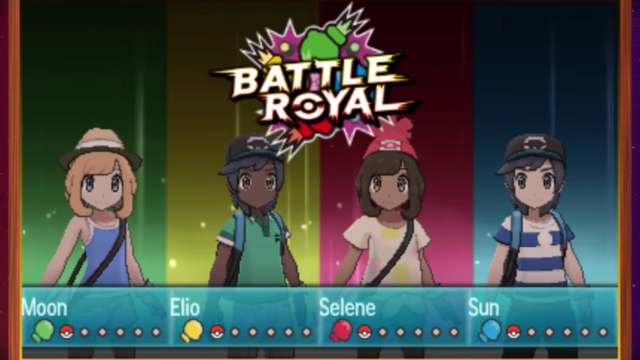 You can play on your own against three NPCs by visiting the Battle Royal Dome on Royal Avenue, or duel with up to three friends via the Festival Plaza. Battle Royals are held at the Battle Royal Dome. 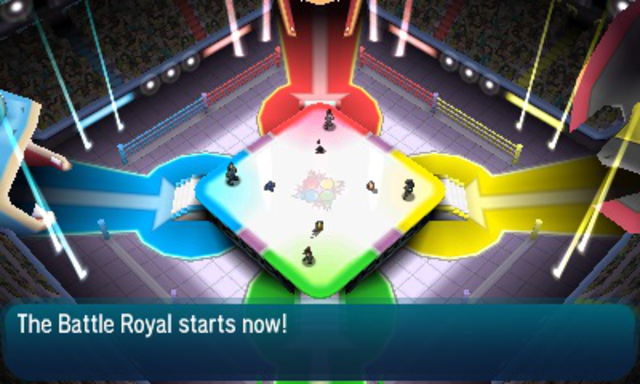 The Battle Royal Dome has four corners: red, blue, green, and yellow. Each corner has an entrance shaped like a Pokémon's head: the red corner is shaped like Charizard, the blue corner is shaped like Gyarados, the green corner is shaped like Tyranitar, and the yellow corner is shaped like Haxorus. In a Battle Royal, each player brings three Pokémon, using one Pokémon at a time. At the end of a turn, if a player has no Pokémon left, the Battle Royal ends. All the Pokémon used by NPCs are level 50, and your Pokémon will be brought down to level 50 if their level is higher. However, if your Pokémon's level are lower, they will remain at that level. If a Trainer's Pokémon knocks out an opposing Pokémon, that Trainer receives a point. If a Pokémon faints due to indirect damage, such as poison or burn, the point is awarded to the Pokémon who caused the indirect damage to occur. If a Pokémon faints due to self-inflicted damage or effects, such as from recoil or Explosion, no points will be rewarded to anyone. The battle is over at the end of the turn after all of any one Trainer's Pokémon have fainted. The winner is determined based on the combined total of the KO points they earned and their remaining conscious Pokémon. If there is a tie, the winner will be determined based on whose Pokémon have the most remaining HP. A Trainer who had all of their Pokémon faint cannot win, even if they have the most points, unless all three opponents also lost all of their Pokémon. You are not allowed to use Legendary Pokémon (Guardian Deities and Ultra Beasts are exceptions). Furtherm you cannot use two of the same Pokémon, or two of the same items. While the rules are basic, the players must carefully consider who to attack and who to save – if so inclined. The unpredictability of it brings something fresh and new to the table. Trying to anticipate what your opponensts will do next and forge battle strategies is half of the fun. You unlock each rank by winning a battle in the previous rank. By beating the Master Rank, you get the Battle Royal Master Ribbon and you unlock the Idol Battle Style. You get Battle Points (BP for short) for each Single Player Battle Royal you participate in. You gain 1 BP if you lose the battle, 2 to 4 if you get second/third place, and 2 to 5 BP if you win. The amount of BP you gain for winning or getting second/third place depends on the rank you're playing in. You can use BP to buy items in the Battle Royal Dome or at the Battle Tree. Make sure your Pokémon have diverse movesets. Each of your Pokémon is battling against three others, so it should be able to take on as many types as possible, preferably the types it is weak against. Don't switch out your Pokémon. It's possible that your Pokémon will still be hit (maybe even three times) before switching out, and the Pokémon switching in will take the rest of the hits, if not all. Keep Speed in mind; the higher your Pokémon's Speed stat, the earlier it will be able to attack. However, this doesn't mean that only fast Pokémon are useable, as slower Pokémon often have higher attack and/or defense stats. Attacks that hit all Pokémon (e.g. Earthquake and Surf) do lower damage when hitting multiple Pokémon than one. These attacks can still be useful, but keep this in mind. When you try to attack a Pokémon that has already been fainted by another opponent, your move will fail. So try to predict who will try to take out who, so you don't waste your move. Defense is also important. Your score is partly based on how many Pokémon are left in your party at the end, so making sure they stay alive is just as important as defeating your opponents. Using Protect or healing moves can help with this.